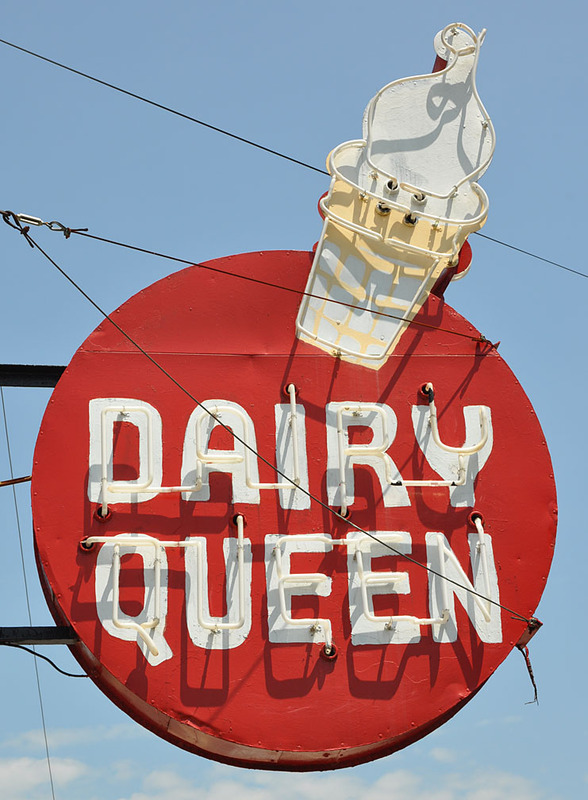 The first Dairy Queen opened in 1940 in Joliet, IL, serving only soft-serve ice cream. By 1947, there were about 100 stores. By 1955, there were 2,600. Today, there are more than 5,900 locations worldwide. 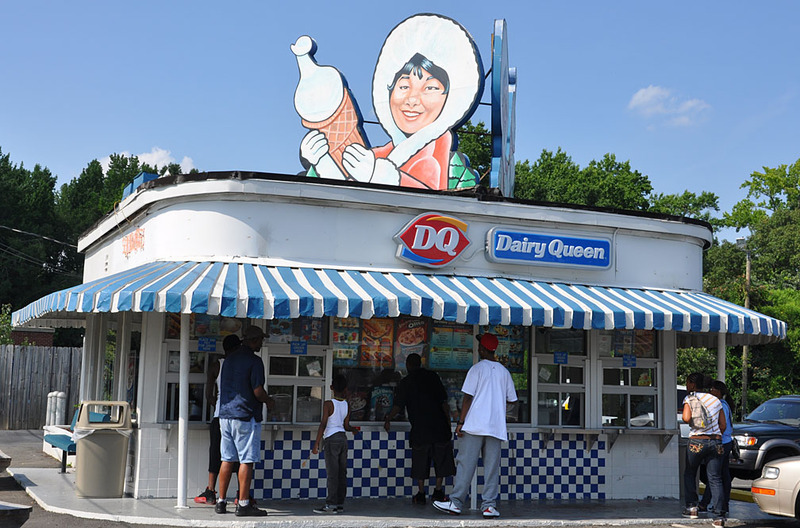 In the early 1950s, Dairy Queen developed its slanted roof, rounded corners walk-up building with the classic tilted cone sign. In 1960, the company dropped this design for its barn-like building. 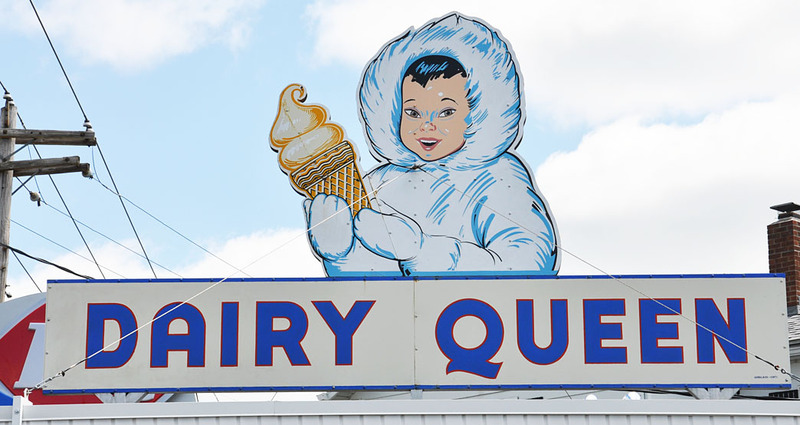 For more about Dairy Queen, see this website. 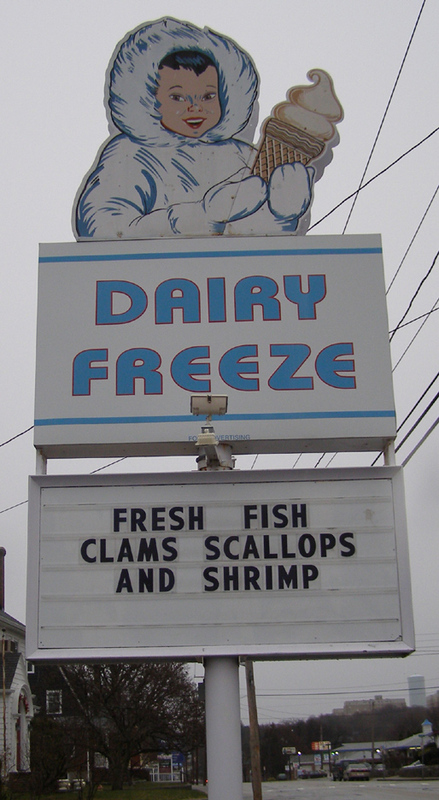 A similar sign existed in Wilmington, NC which was a two-piece triangulated sign. It was built around 1950. The sign was removed in 1998 and has been in storage at the Cape Fear Museum since then. 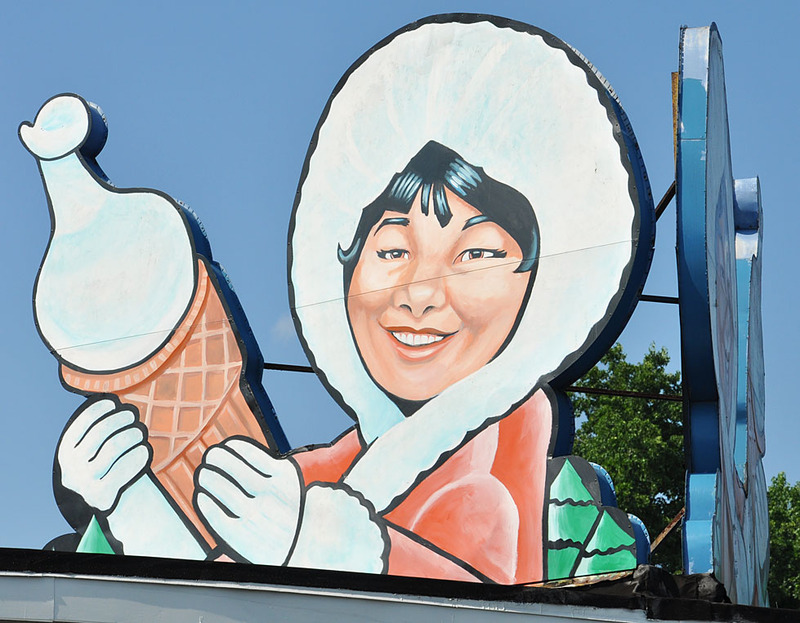 This Eskimo character also appeared on the company's cups. 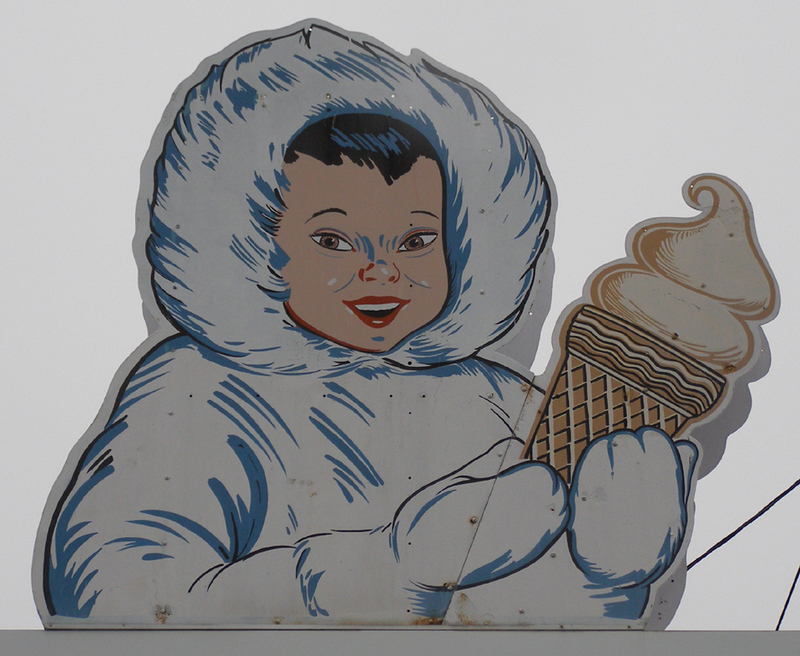 There were other Eskimo signs like these in Watertown, MA and Greenville, SC. The National Animated Sign Co. in Hot Springs, AR developed waving signs in the late 1940s and patented the design in 1951. The company produced many variations of these bellhops including doormen, chefs, butlers, service station attendants, waitresses, cowboys, Indians, and others. All of these signs were about seven feet tall. To notify passing motorists when a store was open or if a motel still had vacancies, the figure's arm moved up and down and the light behind the hand was lit. 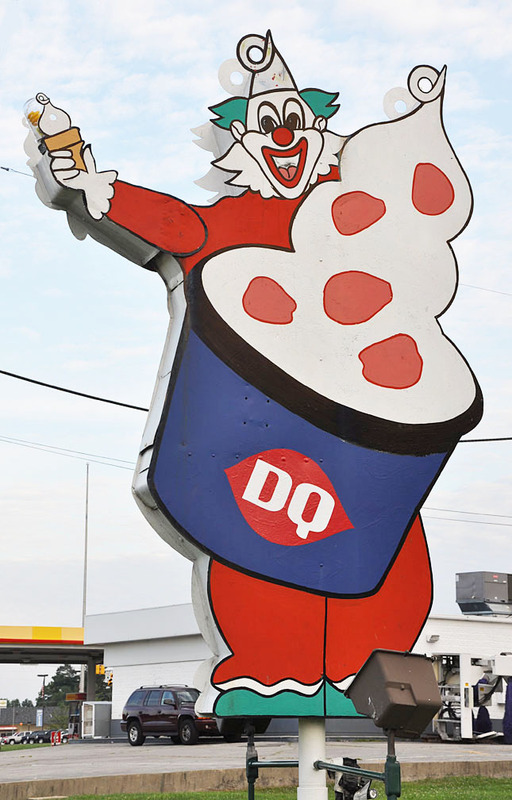 In 1951, the National Animated Sign Co. produced a clown sign for the local Dairy Queen in Hot Springs. 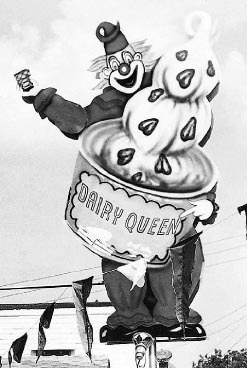 The sign company proposed the name of "Curly the Clown" and hoped that Dairy Queen would use the design nationwide. 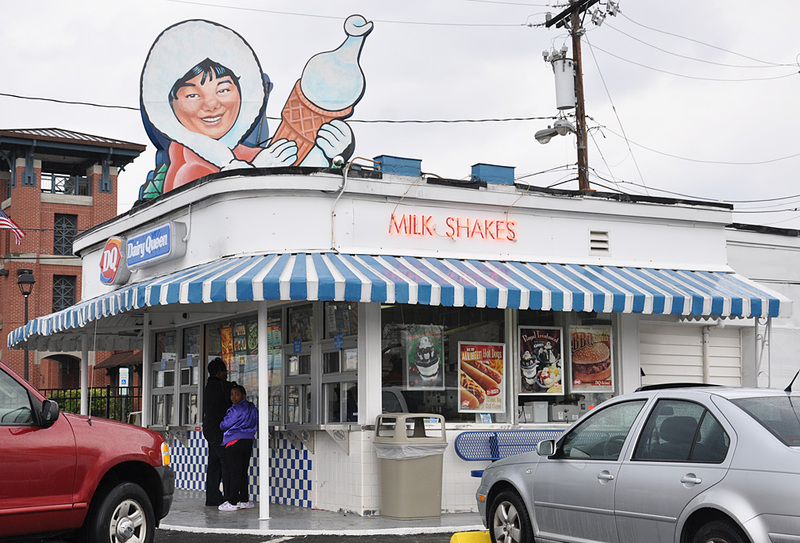 However, Dairy Queen didn't take them up on the offer and the character was never used in advertising. 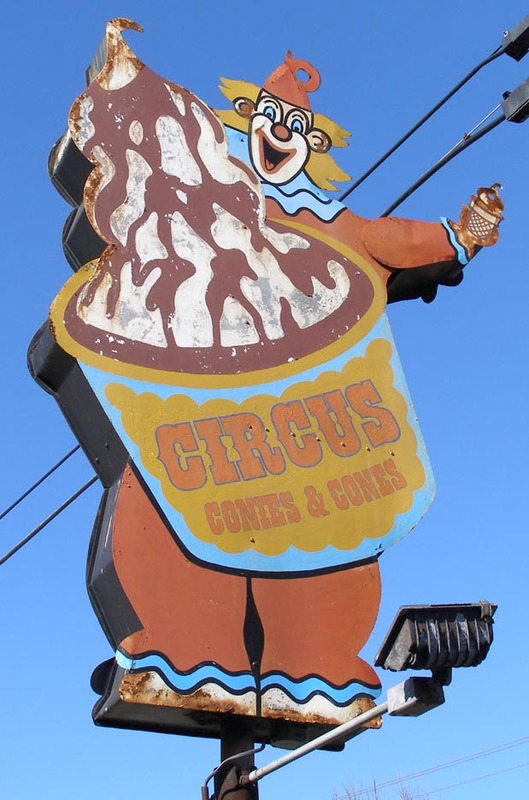 The Hot Springs clown sign was eventually removed and it is now in a private collection. The folks at Dairy Queen corporate know nothing about these clown signs and have no explanation for the two other clown signs at the Shelbyville, IN location (see below) or for the one in Richland, MO. 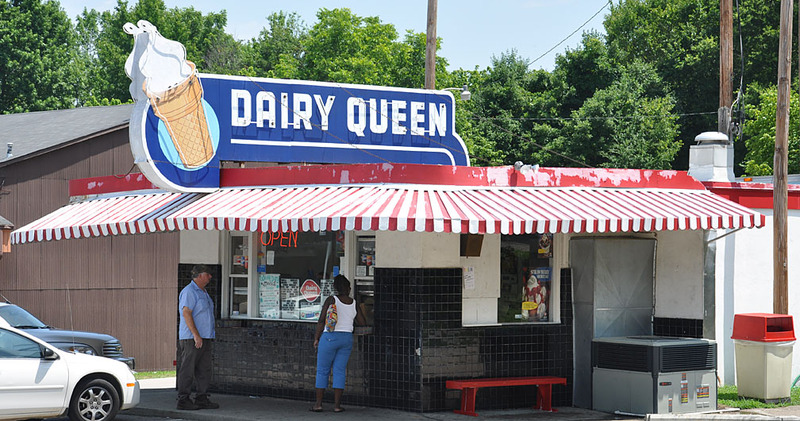 The Richland Dairy Queen sign was repainted when the name was changed to Dairy King and again when it became the Burger Stand. There was another clown sign in Bowling Green, KY. 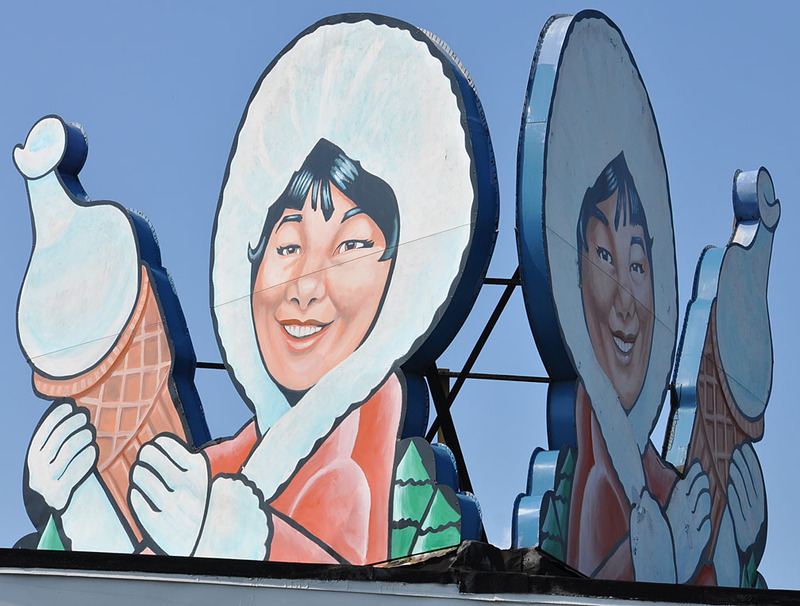 The National Animated Sign Co. also built similar clown signs for other ice cream stands. 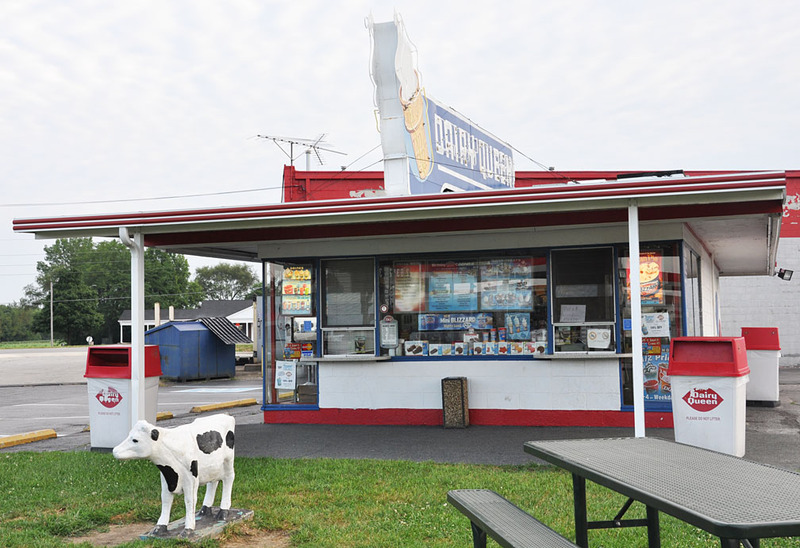 There was also a Dutch Girl in Wytheville, VA which held an ice cream cup just like these Dairy Queen clowns. 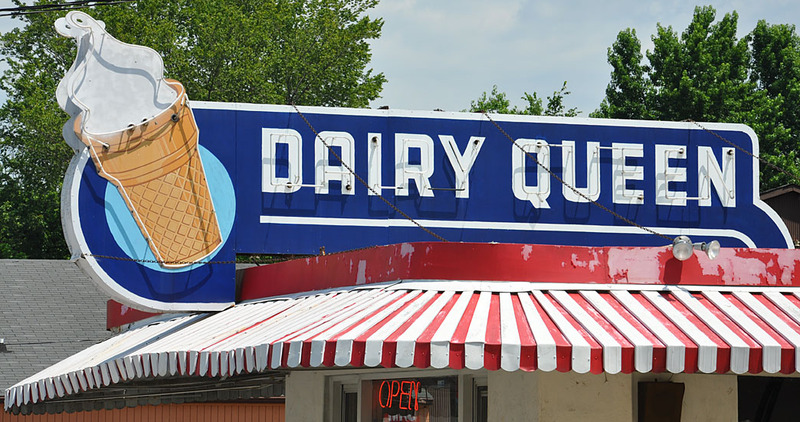 I don't know if that sign originally advertised for Dairy Queen. I'm told that this sign came from the Circus Drive-in in Lyford, IN. It may have been moved to Seelyville in the 1980s. There was no sign of an ice cream stand there. 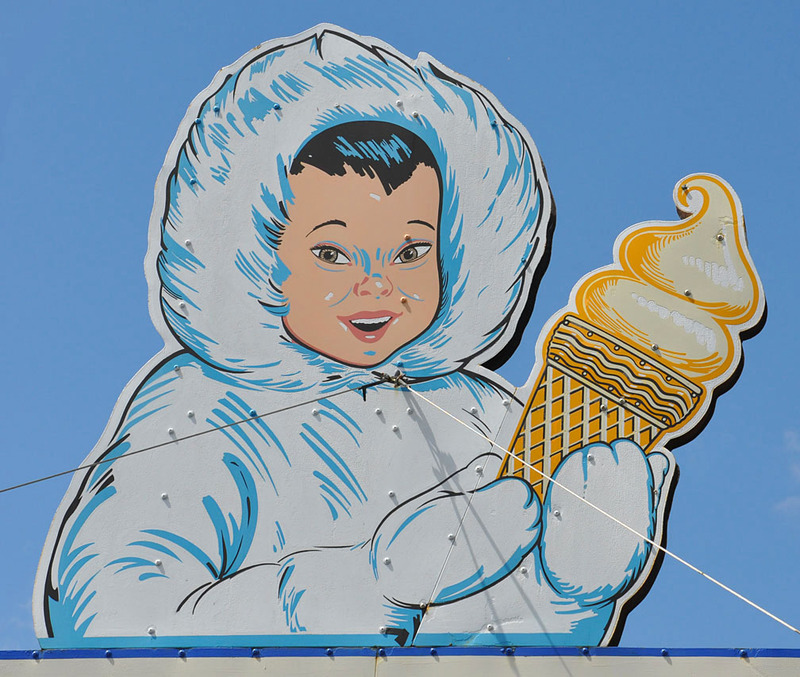 I also don't know if this sign was sold directly to a Circus Drive-in or if it was at a Dairy Queen before that. This sign was still there in 2013 but gone by 2018.